I can boldly say that here and now the radical right is back! The radical narratives mounted by Hungary’s ruling Fidesz Party and far-right movements are gaining ground ahead of next year’s parliamentary elections. Euronews reporter Valerie Gauriat traveled to Hungary for the national Republic Day to hear from supporters and critics of Prime Minister Viktor Orbán’s hardline stance on immigration—and what it means to be Hungarian. Hungarians commemorate Republic Day on every October 23 to mark the 1956 uprising against the Soviet-ruled communist regime. And this year, Orbán took to the stage to lash out against globalisation and a “migrant invasion”. “The forces of globalisation are trying to force our doors open, and are working on turning us Hungarians into Homo Brusselius,” said Orbán in his speech, and blasted “financial empires” for the rise of globalisation. In another part of town, we met Balázs László, who is waging another kind of fight in Hungary. The 22-year-old is the co-founder of the new radical right-wing movement Force and Determination, which hopes to run in next year’s parliamentary elections. “According to statistics, in 50 or 60 years’ time, our continent’s population could be replaced, from an ethnical point of view. It’s estimated that around 30 million, and even up to 70 million Middle Eastern Muslims are already living here in Europe. There are about 10 to 12 million people from the Eastern European gypsy community, not to mention the number of African immigrants. In the next 10 years, up to one billion people could leave Africa. Our population is dropping all the time, while the number of people who are coming here, or those who are already living here, is growing continuously. And if we don’t see this, then we can be sure that white people will disappear,” László said. It’s not clear to which statistics László is referring. However a Pew Research report from 2015, before the migrant crisis, predicted that by 2050 Muslims could represent 10% of Europe’s population, or 71 million people. His supporters also had his back. 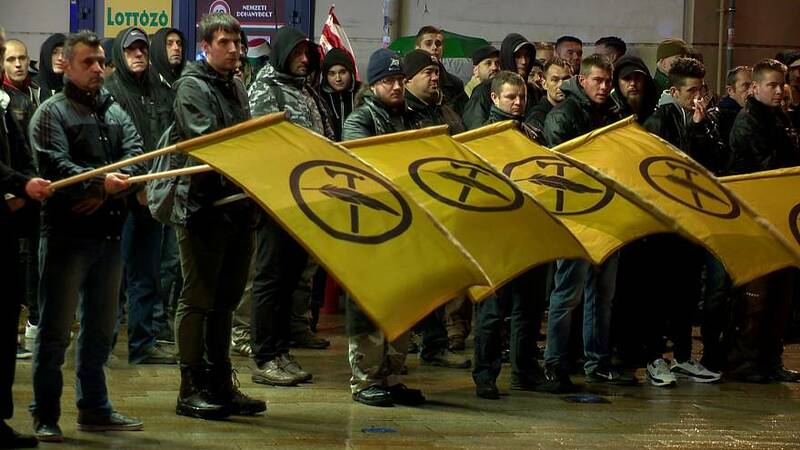 When euronews asked: “What do you say to people who say this movement, this party, is like the neo-Nazis?” the interview was interrupted by László, the movement’s young leader. A man then shouted out to the euronews crew, “Idiots! What the ****!“and hit our camera. We had to leave quickly. Defending Hungarian identity against foreign “invasion” is also one of the government’s main lines. The target of its latest nationwide campaign is George Soros the Jewish, Hungarian-American billionaire. The government has attacked him for what it claims is a “plan” to bring millions of refugees into Europe. Soros is also the main target of a new law that stipulates that NGOs that receive more than €24,000 a year in foreign funds must identify themselves and register as “organisations supported from abroad”. The law is the object of an infringement procedure by the European Commission. For the Hungarian branch of the Open Society Foundation, George Soros’ human rights charity, it is a dangerous law. “This stigmatisation is all about making NGOs look like foreign agents, and it makes it harder for them to get funding because it’s less likely that people will want to support organisations labeled as “foreign agents”, said Csaba Csontos, spokesperson for the Open Society Institute in Budapest. Our next stop is the Aurora Community Centre, which houses offices of NGOs that work on human rights and the rights of minorities. On the pavement near the entrance, anti-Soros tags are left behind by a far-right group. We then head south, to the border with Serbia. Here, a 175-kilometre long fence has been erected after thousands of illegal immigrants crossed the border into Hungary in 2015. Some people here in the small village of Ásotthalom are resentful of George Soros’ pro-immigration stance. Another woman said, “We don’t want to be infested, we don’t want other nations to come and disturb our Christian values. The mayor of Ásotthalom, László Toroczkai, produced a controversial YouTube video in 2015 in a bid to curb migration. It has nearly two million views. In it, he tells “illegal immigrants” trying to reach Germany to avoid Hungary, advising them to go through Croatia and Slovenia instead. Toroczkai is also vice-president of Jobbik, Hungary’s radical right-wing party that has become the largest rival to the ruling Fidesz. He has set up his own border militia and claims a handful of civilians have captured more illegal immigrants than the state police. “Many people arrived here from Pakistan, from Bangladesh, or for example, from Morocco or Kosovo. And there are no wars there, they are not refugees. But they attack this border fence every week,” Toroczkai said. So who is welcome in Ásotthalom? “We want to preserve our traditions. I respect Islam, but it’s impossible in my country because Islam is not compatible with Hungarian traditions. This is a Hungarian town, this is a Roman Catholic town. We can accept those people who respect this fact. A Hungarian, Catholic, European town,” he replied. Toroczkai is also known for wanting to ban traditional Muslim dress and the call to prayer, as well as the “propagation of gay marriage” and public displays of affection by gay people, to “defend” the traditions of the village. His village is used as an example by far-right and white supremacist movements in Europe and in the United States. It has also attracted people who match the mayor’s idea of “acceptable” foreigners. We are shown to the house of a German citizen, who recently moved to the village. When we asked why she moved to the town, she replied: “Ah yes! I can say! But you will not dare show what I say to you!” she said. She explained further: “Merkel! Merkel is Satan! Merkel and Soros! They are the Trojan horse!” before inviting us in. Regina arrived last May. Her home lies a few hundred metres from the anti-immigration fence, and she says she feels safe here. “The borders are open today in Germany, it’s a scandal! It’s a scandal! And I thought I must get out of there. And I thought this place is OK, there is a border, they will protect the border. And I knew that if the migrants come over the border, they would not murder me, but they would go to Germany. For the money! But one day, it’s sure, there will be no money left in Germany!” she said. Illegal migrants entering Hungary face up to three years in jail. Last spring, the Hungarian parliament adopted amendments to its asylum law, which allow for the automatic detention of all migrants in transit camps at its borders. The vote drew an outcry from human rights groups and is the object of an infringement procedure by the European Commission. With the camps off limits for the media we travel over the border to Serbia. Some 6,000 asylum seekers trying to get into Hungary are waiting in the country’s refugee centres. The Subotica camp is the closest to the Hungarian border. There are mainly families here, who have to wait around a year and sometimes longer to be signed up on the lists of those eligible for asylum in Hungary. Back in Hungary, our journey is almost over. We travel to the place where the fence ends, at the junction between Serbia, Romania and Hungary, just a few miles away from the village of Kübekháza. Róbert Molnár, Kübekháza’s mayor, welcomed us in the cafe run by the town, where he often lends a hand. He opposes the border fence and is outraged by Prime Minister Orbán’s closed border policy and anti-EU stance. He said teh ruling government’s policy only contributes to isolation and division within the country—and dodges other issues that, he says, should be a priority. “Authoritarian, autocratic regimes always need a big enemy figure to fight against, to wage war against, but the only purpose is to distract attention from the nation’s real problems,” he said. “Problems with the healthcare system have not been solved. Problems with education have not been solved. 700,000 people have left the country, have escaped, because they see no future or hope. And what I see is that today in Hungary everything matters but the people,” said the mayor.